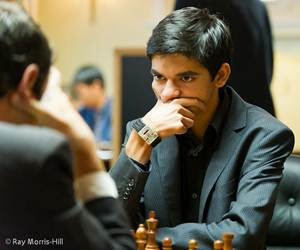 The Cuban player Dominguez faced the solid Petroff defence of the young Dutch star Anish Giri. White got a slightly more comfortable position after the opening. 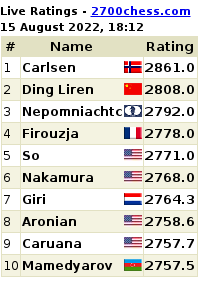 Anish played very accurately in the middlegame and fully equalized. The Dutch player had 3 pawns on the c file but got a pawn up during the middlegame. Not enough to win the rook endgame however. Draw. 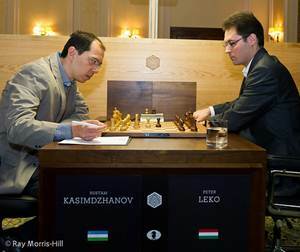 Rustam Kasimdzhanov declined to go into the main line of the Berlin defence played by Peter Leko. 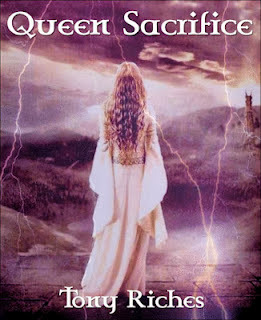 16…Qf6 ! was a very accurate move from the Hungarian player which eventually equalized the position. Players went into a Bishop versus Knight endgame, which ended in a draw in 34 moves. Ivanchuk has chosen today the Nimzo-Indian, which apparently didn’t surprise Mamedyarov who picked up a rare line based on 9.Bg5. 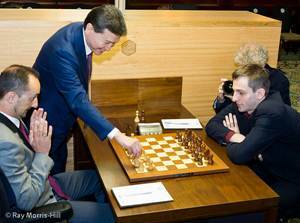 The Azeri player had some difficulties to castle and was able to do it only after 22 moves. Black got a very slightly better position in the Rook+knight endgame. In time trouble, Vasily managed to win a pawn and arrived in a Knight+3 pawns against Knight+2 pawns endgame. However despite several attempts at trying black could get no more than a draw. 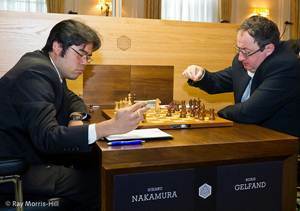 For the first game of this event, Boris Gelfand, the former challenger for the World championship match, decided to surprise his opponent by playing a Sicilian Sveshnikov. The American player went for a sideline with 9.a4. Gelfand took slowly the advantage, blocking the queen-side on black squares. 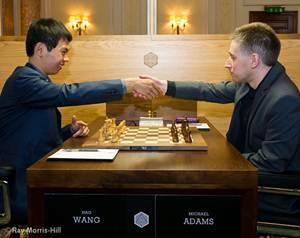 Boris played his 40th move with only 7 seconds on the clock, maintaining the pressure! Black slowly squeezed white’s position until finally white collapsed definitively. 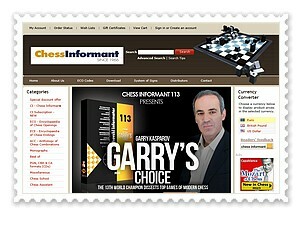 Check the game in the Chess King applet. The English opening played by the Bulgarian player Veselin Topalov was an interesting choice to avoid the main weapon of Alexander Grischuk: the King’s Indian. Pieces were exchanged quickly and white got a slight edge. The game started to get sharp while the players began to be short on time, Grischuk got forced to sac a piece for four pawns. 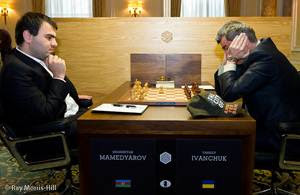 Position of the Russian player was very solid, and both players agreed for a draw after 43 moves.